In the days before running a bookshop, I spent a bit of time at the other end of the ‘paper supply chain’ – timber production. And not just any old timber, but tropical hardwood. I helped develop a system (still going strong) which tracked timber from the forest, proving (amongst other things) that the patio set you just bought from your local garden centre did indeed start life as a legally felled log – and definitely not from a shady illegal operation. So when (ahead of two school events with him tomorrow) I started reading Andy Briggs’ Tarzan: The Greystoke Legacy I was - quickly, brutally, and in an utterly compelling way - plunged back into the world of illegal timber in the rainforests of Congo. 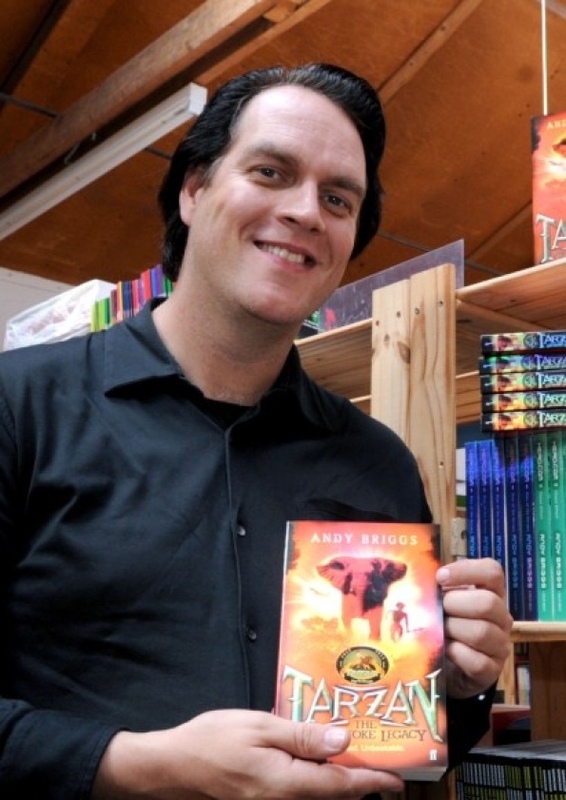 Boy oh boy, is it an exciting read...here's a picture of Andy at the recent launch of the book at Scotia Books. We have been involved in one or two franchise ‘reboots’ this year, and it seems to be an increasingly attractive thing for publishers to do: this year there has been Deaver’s Bond, Lustbader's Bourne and forthcoming attractions include Cottrell-Boyce’s “Chitty Chitty Bang Bang” and Anthony Horrowitz’s Sherlock Holmes novel “House of Silk”. But rebooting Tarzan? It wasn't clear to me that that bringing Edgar Bice Burrough's creation back to life would work. 2012 is the one hundredth anniversary of the original Tarzan, and – like many people my age – I grew up with the tail end of the black and white Tarzan on Saturday morning telly, with Cheetah and Jane. However, I would be hard-pressed to tell you much about the characters and the stories, aside from swinging through the trees, thumping his chest and uttering that well-known roar. But Tarzan on TV bore little resemblance to the original book, and Andy Briggs has sensibly gone back to Rice Burrough’s original tale, a book of surprising emotional depth (it's a great love story), and one which sits well with other science fiction writing around that time. Instead of (say) War of the Worlds, which extrapolated modern developments in warfare, Tarzan worked with ideas of identity, race and civilisation that are still very much relevant today. Briggs stays very close to Burrough's original premise: of a boy adopted by a gorilla, who grows up to become a 'white ape' and Lord of the Jungle. Taught about the outside world by the mysterious D'Arnot, we first meet Tarzan dispatching (in a suitably savage way) three very nasty poachers, against an all-to-realistic backdrop of civil war and environmental destruction. The main action though begins in an illegal logging camp. Jane Porter is the daughter of one of the loggers, a man who has fled America after losing almost everything of value to him - and when the camp is attacked and Jane disappears, it seems as though he will lost his daughter too. Jane has already been removed from her previous life, cut off from the outside world, sending emails from her iPhone destinated never to arrive by dint of the utter remoteness of her situation in the camp. And when she disappears, a young boy in the camp, Robbie, sets off in hotheaded pursuit. Thus begins a tense yet thrilling pursuit through the forest on the one hand, whilst on the other hand the relationship between Tarzan and Jane - and the slowly unfolding truth about who Tarzan is - begins to emerge. I particularly liked the nuanced portrayal of everyone - ape or human, father and daughter. No-one is entirely good or bad (Tarzan is certainly no angel) and the nice moral ambiguities work well within the the exciting plot (rip-roaring is an understatement).